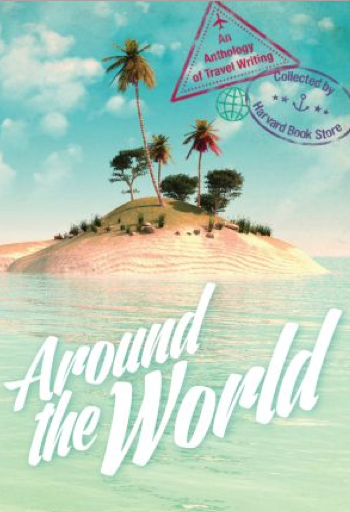 I’m pleased to be a part of a spiffy new anthology of travel writing with my travel essay “The Blind Warthog,” assembled by the gang at the Harvard Bookstore and printed by their in-house robot. But then, I’ve just arrived. There’s a night walking safari; I shouldn’t go at all, but I definitely can’t go unless my wife will take me. Back at our room, we squabble, I get irate, I go to spite her. Yeah, well, I don’t need you. I spray nitro, slap on a nitro patch. I hurry to grab the group, bringing up the rear of maybe 30 people out through the gates. They’re moving too fast, an amoeba with one shared cell, one shared will; I get angina. I lag behind with my swinging camera and my penile lens. We’ve moved into pitch; they’re scarily far ahead. I swivel. Total darkness in every direction. My voice doesn’t carry. They don’t have a clue I’m here, fallen behind, embarrassed and lost. Blind animals: some moles, blind huntsman spider, troglobites. I wanted to study inter-species communication to work the way Irene Pepperberg did with Alex, the African gray parrot, at U of AZ, Harvard and Brandeis; I wasn’t sure if I wanted to study gorillas, chimps, dolphins, corvids or parrots. Maybe you mean to become something, and you end up becoming something else; maybe if I hadn’t gotten sick, I would have ended up researching the breeding habits of angelsharks or the nesting habits of brown cowbirds and not lived out my dream anyhow. Maybe I would have ended up doing something completely different—law, say. African lodges skew male: trips built around encounters with the Big Five: lion, leopard, Cape buffalo, rhinocerous, elephant. Action adventure, chase and claw, living animals scored from their bones as they scream, predators up to their shoulders in blood. Yeah yeah yeah yeah, The law of the jungle. Life, death. Let’s ask the question: What is a traveling woman’s Africa? Would female-only safaris opt for a different wildlife experience? If women shaped the intinerary, drove the vans and were the clients, would our days be markedly different? Would our wish-lists be less linear? Would we observe a troupe of baboons for hours, watch a Vervet infant suckle, read a book while birds in the treetops chatter? The angina goes from regular angina to crescendo angina with every lurching step. Here are my options: Halt in a wildlife preserve with no lick of light, resident lions, leopards, wild dogs, hyenas and warthogs around me, or go forward, possibly into cardiac arrest. I think of my wife, my kids, the stories they will be able to tell if I root to the spot: My poor mother. My darling wife. Shredded by hyenas. Possibly I’m dying, I think, as I go forward. Possibly I’m dying right now. A scorpion of pain. A hippopotamus of pain. Arrythmia an erst of bees behind my ribs. The safari blind, I want to hug it. Thank you thank you, I think as I sag against it until the angina partially subsides. In-breath, slow. Out-breath, slow. In-breath deep. Out-breath shallow. Oxygen, oxygen, oxygen; I need nothing more. My heart is doing flips as my lungs back up; CHF, my old friend, left ventricular insufficiency. I stumble into the blind productively coughing, maybe five minutes behind everyone else. The kitchen scraps have been distributed to draw animals into the light. I still have angina so I can’t speak. I need to sit urgently. Unoccupied stool. Nitro assist. I wait, I wait. When I finally feel okay, I feel okay, more or less. I didn’t die. I still could die in my sleep from the strain I put my heart through, but this is how I live anyway, the guillotine blade above my head, fate’s hand on its string. You are a vascular disaster, a cardiologist once said. The tree of you is dying, said another. Any day, any day, any day now, curtains. I point my camera out the window. African porcupine with black and white striped quills longer than forearms, bristling at some warthogs, bristling at a caracal, bristling hard at a shadowy hyena. What I could have seen: Leopard, Cheetah, Caracal, African Wild Cat, Brown & Spotted Hyaena, Black-backed Jackal, Aardwolf, Bat-eared Fox, Aardvark, Pangolin, Honey-badger, Porcupine, Large & Small Spotted Genet, Striped Polecat, Kudu, Oryx, Red Hartebeest, Gnu or Blue Wildebeest, Eland, Impala, Giraffe, Hartmann’s (Mountain) Zebra, Burchell’s Zebra, Steenbok, Common Duiker, Damara Dik-Dik, Warthog, Chacma Baboon, Rock Hyrax, Jameson’s Red Rock Rabbit, Springhare, Scrub Hare, Ground Squirrel, Dwarf, Slender, Yellow & Banded Mongoose. Lion. When I get back to my room, my wife is asleep curled around dreams of the woman she wants to have as her lover, or perhaps does have as her lover, curled around her dreams of leaving me, so I curl on my side, my back to her. Seen from above, we look like quotations with no sentence. I dream of my neck extending, giraffe-like. I dream I can eat acacia thorns. The morning after I don’t get lost in the wilderness, the blind warthog is on his small front knees in the grass, praying in the yard, as iridescent starlings and red-belled Shrikes hop by him. Shrieks go up and the sky grows very quiet—a black-shouldered kite loops the air waves.